Meet Bella. Bella is my three-year-old Beagle, who also serves as my best friend and partner in crime. Sometimes, it’s hard to find places both Bella and I can go to enjoy our weekends, but living on Florida’s Space Coast, I am able to find some amazing pet-friendly experiences that I can enjoy with my canine cohort. The thing is, there is not anything that wouldn’t be made better by Bella being there, and I want to make sure I take full advantage of every moment and memory that we are able to create together. Historic Cocoa Village is a perfect place to get to know the more historical side of Florida while enjoying the water, shopping, dining, and beautiful gardens and flowers, but what most people don’t know is that it’s a community that has several things for Bella and me to experience together. One of our favorite spots in Cocoa Village is Riverfront Park, which is located in the heart of Cocoa Village. The park has doggie bag stations at each of the main entrances, and the Historic Cocoa Village Association and the Merchant’s Association of Cocoa Village are working on increasing the number of doggie bag stations, as well as installing a number of doggie water fountains and a dog park, which I’m sure Bella is going to love. In addition to Riverfront Park, we’re excited about the new pet treat bakery, Tails at the Barkery. Not only will Bella be allowed to visit to get natural gourmet treats and some cute outfits to don for the holidays, but her friend, Socks, my neighbor’s cat, can also visit as well. Tails at the Barkery is not the only place that Bella is welcome; 75 percent of merchants in Cocoa Village allow pets inside their shops. If I get hungry, several of the establishments have outdoor seating, which allows both Bella and me to chow down. I don’t know who loves to feel the ocean waves crash on them more: Bella or me. 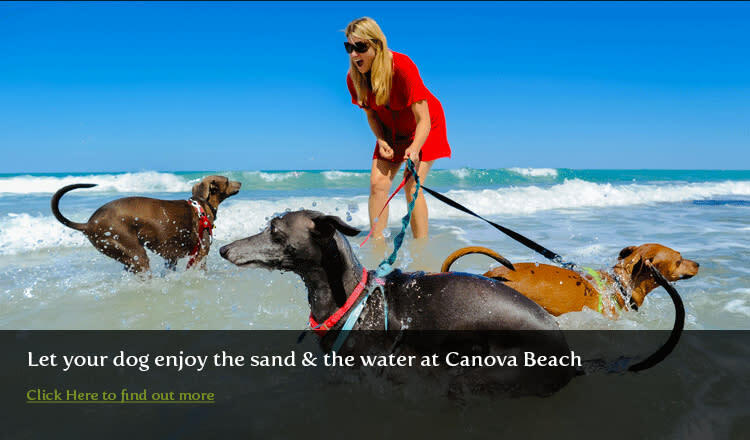 This makes Canova Dog Beach in Indialantic the perfect park for us to enjoy a traditional beach experience. As much as Bella would love to run down the sand to her heart’s desire, I have to keep her on her leash, which is a small price to pay to enjoy the ocean with my best friend. Bella loves to play with her friends at Canova, and she’s so smart; I’m just waiting for the day for her to start building sandcastles!